Things seem to be changing almost daily in the garden, shoots appearing, leaves unfurling and flowers opening. I do like this time of year! It’s been a bit colder but it’s remarkably dry, in fact we could do with a bit of rain! Round the pond the hostas and irises are starting to shoot up and the foliage of the dog-toothed violets (erythronium) has appeared. The hellebores are still in flower though they are starting to droop as the new leaves push their way through the middle. Over the arbour the clematis has lovely fresh lime green leaves and soon the blue buds will develop. The camellia is past it’s best now but it’s still looking colourful. At it’s feet is brunnera Jack Frost which is covered in tiny blue flowers. The fatsia japonica at the back by the fence was planted last year in a very tall blue pot, the area is very shady in the summer with the fence, the wall to the left and the sambuscus spreading it’s branches overhead, so far it’s still looking happy. 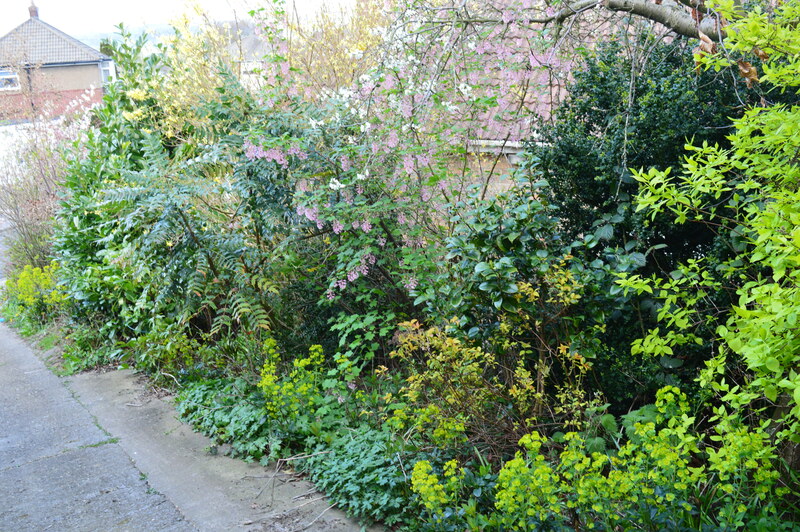 I don’t often show you the front garden, it’s mainly shrubs (and weeds!!) but this little area is looking particularly good at the moment. 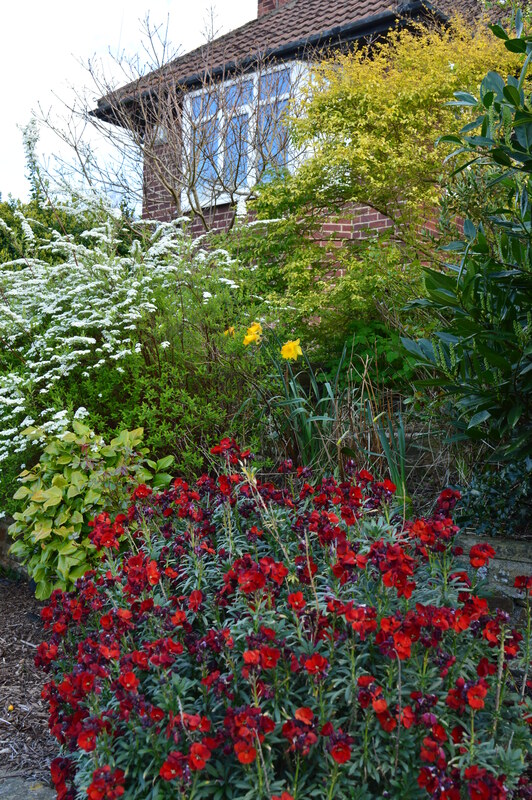 The perennial wall flower has flowered it’s socks off for months now and it’s rust/red flowers are still looking good. The white flowered shrub is a spirea arguta, it’s a very easy going shrub and once it’s finished flowering it gets pruned hard. The golden leaved shrub at the top is actually a privet that has never been pruned, I love it’s light, airy look. Walking down our steep drive there’s all sorts happening now, the white plum blossom is out, the philadelphus has opened it’s lime green leaves, there’s quite a lot of buds on there too so hopefully we’ll have a good display. The flowering blackcurrant is flowering, thaty’re the soft pink dangly flowers, unfortunately the smell is not good – cat pee! Right at the bottom is an amelanchier which is looking very pretty with white blossom and coppery new leaves. I need to do a lot of hard pruning in this bed, the laurel is too big, for some reason the eucalyptus looks dead, I’ll cut it right back and see if it recovers but I’m not hopeful. 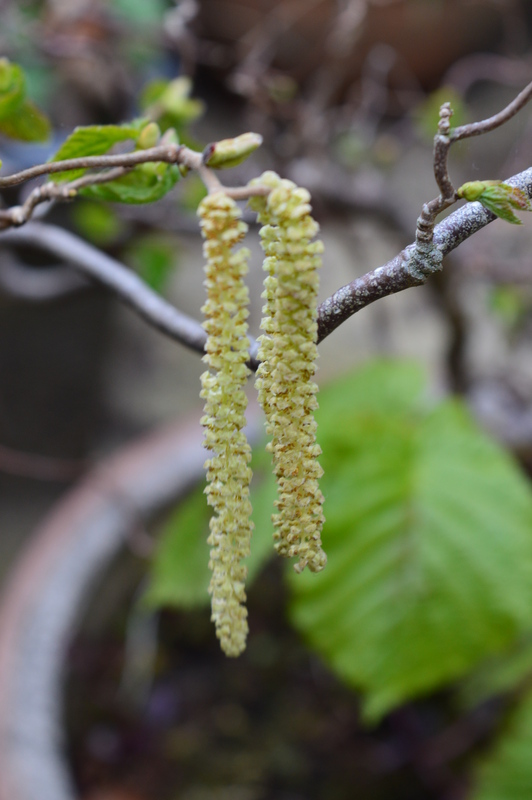 I have finally got some long catkins on my twisted hazel, I’ve had it about four years now and have only had short stubby ones up to now, but look at these! I’ve got a few plans for the garden over Easter, I’ve just bought a garden bench for the Amber & Amethyst garden and I’m going to make an arch to go over it, at least that is the plan. I’ve found some instructions on a blog, just need to get some uprights and find a jig-saw in the garage…I may be some time! your garden is looking lovely, everything is coming to life! Thanks Claire, every time I go out I see something new appearing. Your garden continues to look lovely. I love this time of year and the erythronium are beginning to flower in my garden too – but I am awaiting all the trillium and paris to flower as these are my most favourite! Thanks, I’ve often admired trilliums at shows but never got round to trying them. Oh you should – they are dead easy in the garden. My favourite is trillium grandiflorum – it is lovely and paris japonica is another beautiful plant. Your gardens are amazing! I love your pots of blue such a spectacular color …thanks for sharing your beautiful world of gardens! I am amazed at how things change each week, just spectacular! Amazing garden, enjoyed the totter!